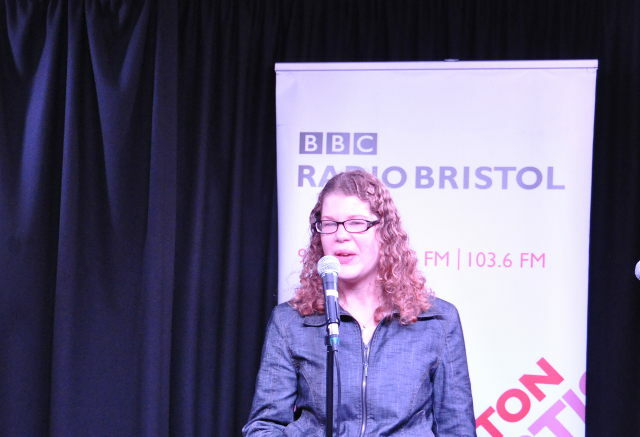 A couple of weeks ago I was invited to perform one of my short stories for a BBC Radio Bristol show called Speech Bubble. The event was designed by lovely Mark Olver to showcase local writing talent, but then the BBC, deciding we need more humour in our lives, asked him to focus on burgeoning comedy writers. This is a bit of a weird one for me because, um, I’m not that funny. A lot of life amuses me, and I’m drawn to the absurd, but much of my short fiction dwells in the darker side of the human psyche. While it’s often uplifting, it’s probably as likely to make you shed a tear as crack a grin. However, I did my best, wrote a whimsical short tale (just a couple of minutes reading time) called The Notes, and you know what? They liked it! On a Wednesday evening in March we recorded the episode at Smoke and Mirrors (apparently the UK’s only ‘magic bar’) and I became the “and now a change of pace” provider – a key role, I’m sure you’ll agree, in any ensemble show. For the next 20-something days, you can listen to the show here: www.bbc.co.uk/programmes/p02mx80z. The monthly six-part series has three more episodes to air and is hoping to return soon, so if you fancy your chances of making the ex-housemate of Russell Howard and Jon Richardson (what must that have been like?) chuckle, send your comedic ramblings to bbcspeechbubble@bbc.co.uk – you could end up performing your work! This entry was posted in Judy's writing and tagged BBC Radio Bristol, Mark Olver, Speech Bubble by Judy. Bookmark the permalink.